A talented blacksmith who has his heart set on Elizabeth, Will selflessly throws himself into danger in order to rescue her when she is kidnapped by pirates, going so far as to join forces with Jack Sparrow, whom he severely mistrusts. Unknown to everyone around him, Will's father, Bootstrap Bill Turner, was responsible for the theft of the last piece of Aztec gold, therefore his blood is key to the lifting of the Aztec curse. Upon this revelation, Will threatens suicide when his friends fall into Barbossa's grasp, but he is no match for Barbossa's backup, which turns out to be Pete and his band of Heartless. Sora's and Jack's intervention frees Will from the pirates' clutches, and he reverses the curse by spilling his blood upon the treasure. He reunites with Elizabeth once the immediate threat is over. When Port Royal is haunted by cursed pirates and Nobodies once more, Will takes it upon himself to investigate the treasure, only to escape Luxord with barely his life. He continues to help Sora and his team in gathering the Aztec gold and defeating Luxord's plans, but a return to the quiet life is not to be when Elizabeth pulls Will into becoming one of Jack's crew. Who knows what awaits Will on the high seas? 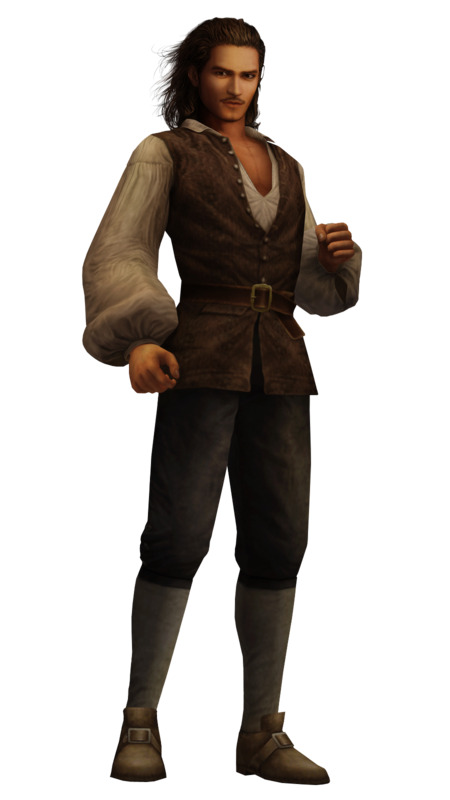 A former blacksmith, Will Turner's life changed when he met Captain Jack Sparrow and embarked on a journey to rescue Elizabeth Swann from the hands of Captain Hector Barbossa. He is the son of Bootstrap Bill Turner, who is a member of Davy Jones' crew on the Flying Dutchman. Will was set to marry Elizabeth Swann, however the nuptuals were interrupted by Lord Cutler Beckett, who arrests both Will and Elizabeth. Beckett to free Elizabeth if Will steals Jack Sparrow's compass. Will finds Jack on an island inhabited by cannibals, and the two make a daring escape back to the Black Peal. They take the ship to the voodoo priestess Tia Dalma, who reveals that the weakness of Davy Jones' is his heart, and his heart currently resides in the Dead Man's Chest. Will is tricked by Jack into going onto the Flying Dutchman and becoming a member of its crew. It is there that he meets his father, and learns that the key to the Dead Man's Chest resides around Davy Jones' neck. Will makes a daring escape with the key, and makes his way to Isla Cruces, where the chest is buried. It is there he encounters Jack Sparrow and Commodore James Norrington, and the three fight over the key. Norrington escapes with the heart and Davy Jones, who followed the crew, sends his Kracken to take down Jack Sparrow and the Black Pearl, and the two are sent to Davy Jones' Locker. Will joins Elizabeth, Gibbs, Barbossa, Tia Dalma, and the rest of the Black Pearl crew on the journey into Davy Jones' locker to bring Jack Sparrow, Sora, Donald, and Goofy back to the world of the living.